At Grand Vegas Tours we can provide you with exciting Grand Canyon or Hoover Dam tours so that you can experience the natural beauty and history the Southwest has to offer. All of our luxury bus tours include a professional separate tour guide that will lead you to the most popular and incredible less known viewpoints. We are committed to the safety of our tourists, and we have a high safety standard and record. We create the good by giving back to our community! A percentage of your purchase today will be donated to the Nevada Partnership for Homeless Youth. All of our Grand Canyon tours include a 15 to 20-minute stop photo opportunity of the Hoover Dam. We’re family owned so we offer authentic local experiences. Enjoy a more personalized and interactive small group experience. Guests will travel with our professionally trained tour guides while learning about the flora, fauna, geology, and the history of the Southwest. Our Mercedes Sprinter is specially designed for sightseeing, and it seats up to 10 guests per vehicle. 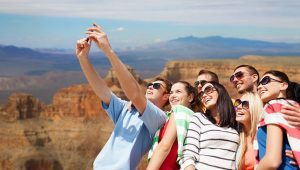 At Grand Vegas Tours we know how to deliver the ultimate travel experience and leave each guest appreciating the natural elements that surround them. If you are planning a special event, wedding, family reunion, or an office retreat we have the perfect tour! Our qualified sales team will assist you in planning a memorable excursion. Please call us at 888-866-4135 for more information. Let us create your next dream tour. ©2019 Grand Vegas Tours . All Rights Reserved.